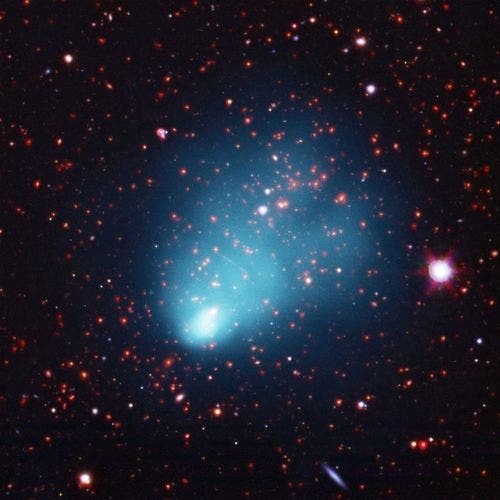 The El Gordo galaxy cluster— which means "the fat one" in Spanish — is officially known as ACT-CL J0102-4915 located located more than 7 billion light-years from Earth. Astronomers hope it could one day reveal secrets about the invisible dark matter that fills the universe. The monster galaxy cluster has mass about 2 quadrillion times that of the sun, making it the most massive known cluster in the observable universe. Galaxies within the cluster are concentrated in two distinct groups, and gas in El Gordo can reach super-high temperatures of nearly 360 million degrees Fahrenheit (200 million degrees Celsius), based on X-rays collected by Chandra and the European Southern Observatory's Very Large Telescope in Chile which suggests that cluster is the site of a violent merger between two galaxy clusters. El Gordo was discovered using NASA's Chandra X-ray Observatory in space and the Atacama Cosmology Telescope in Chile. The scientists detailed their findings at the annual meeting of the American Astronomical Society during a presentation that included a separate announcement of the discovery of the most distant galaxy cluster ever seen in the early universe.